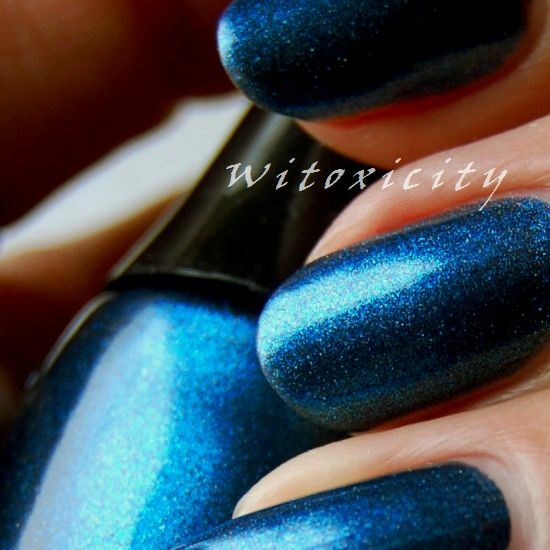 Let's take a look at KOH Midnight Blue, something from KOH's permanent collection for a change. In the run-up to the investiture of the Dutch king this coming Tuesday, KOH has been highlighting four of their permanent shades, three representing the Dutch flag colours and, of course, KOH Dutch, an orange, an absolute must around Queen's / King's Day. The three colours that KOH has picked out to represent the Dutch flag this time around are the classic KOH Red, the pristine white KOH Crystal and the broody KOH Midnight Blue. KOH Midnight Blue is a lovely one, especially if you like broody colours. It's like looking into a metallic night sky that is chockful with stars. It's a dark blue with a little green tint. I've got two coats on here. For the red-white-blue colours. I didn't want to do something 'flaggy' like I did last year. So, I gave water-marbling a whirl. 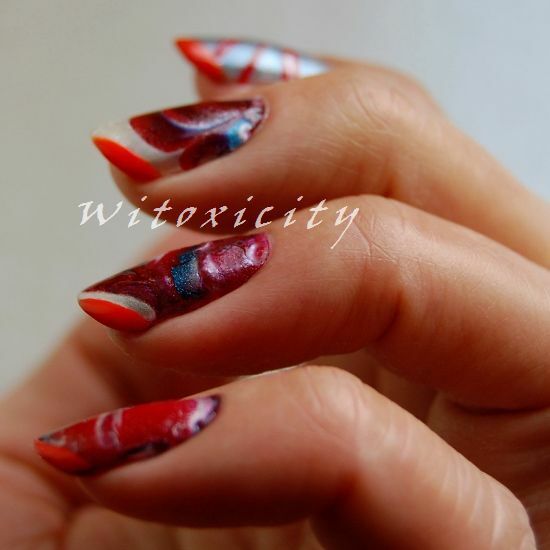 Oh, water-marbling! You could say water-marbling is fun and unpredictable. You never know how it would turn out. I'll admit though it's not something I would do often. It's tedious and it's messy (even with tape). I'm sure it's nothing new to you but if this is unfamiliar territory, you can check out Youtube to see how the water-marbling gurus do it. I admire their patience and dedication. 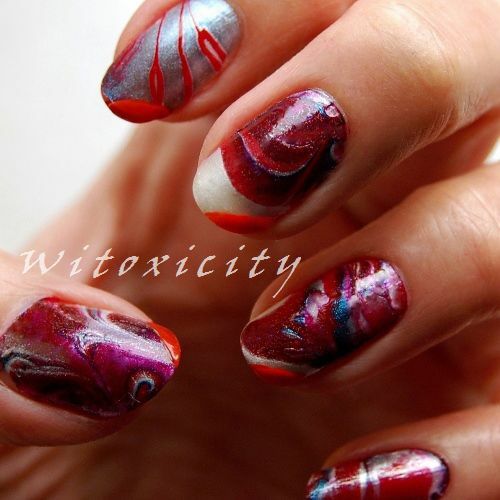 This water-marbling was done on a white base of KOH Crystal. KOH Red turned out to be very dominant in the end result but I don't mind. One can't go wrong with a classic red, swirls or no swirls. As for the orange, I didn't include it in the marbling. I just added a touch of it in the corner to give it a Dutch feel. 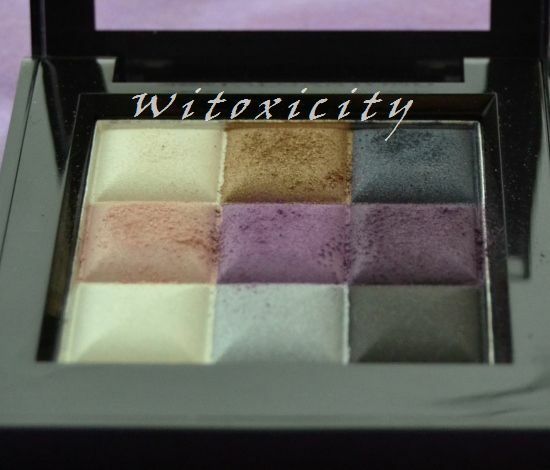 There were six variants of this eyeshadow palette. They looked promising and fun with three times three shades. The more the merrier, I thought. With this one though, they could have had one less white eyeshadow and replaced it with something-other-than-white. White eyeshadows and I aren't exactly best buddies. They look like chalk on my lids. 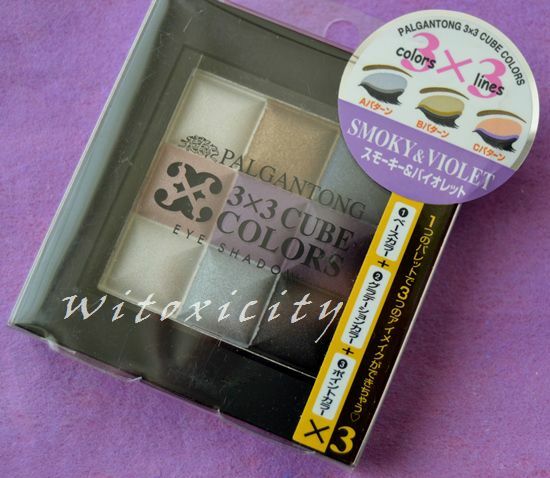 This is Palgantong's 3x3 Cube Colors Eye Shadow palette and the variant that I have here is called Smoky & Violet. I know, I know, since I hate white eyeshadows so much, it defies logic that I bought the one palette with two whites but if you asked the demure sweet-young-thing Sasa sales assistant, she would gladly launch a discourse on how one is actually a pearlescent white and that the other is duller and a shade darker. Yeah, whatever. White is white is white. In the store, I agonised over which palette to buy (that same demure SYT thought I was up to no good standing near the Palgantong display shelf for ages). It basically came down to this one and another palette with earthy browns and greens. In the end, it was the purples, the dark blue and the golden brown in Smoky & Violet that got me, especially the golden brown in the top row. Oh, I don't know.....perhaps, on hindsight, I should have taken the browns and greens instead. 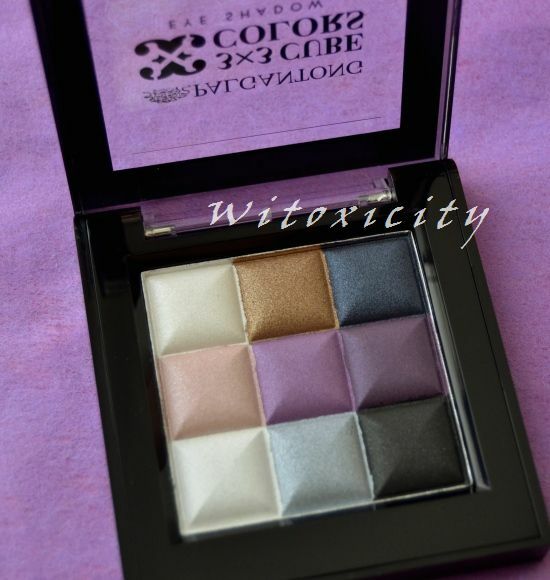 The palette is a handy size but it has neither a mirror nor an eyeshadow brush/applicator. It measures 7 x 7.5 cm and on the back of the outer packaging, Palgantong tells you in Japanese how to use the complementing eyeshadows. That's fine but really, there's nothing to stop you from using the eyeshadows however you want. All swatches were heavily applied on a base of Too Faced Shadow Insurance. They all have a quiet, pearly lustre finish. 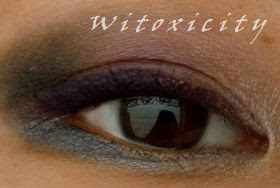 Below are two eye looks done using this palette. For both looks, I used Too Faced Shadow Insurance, GOSH Velvet Touch Eye Liner in Black Ink and Lash King mascara in BK999. The eyeshadows are quite crumbly but it's nothing too unusual. The concept (3 by 3), the name (3x3 Cube) and the available colours are nice but there is a but. The eyeshadows aren't that great. Palgantong is a Japanese brand and from a Japanese brand, I expect top quality products. 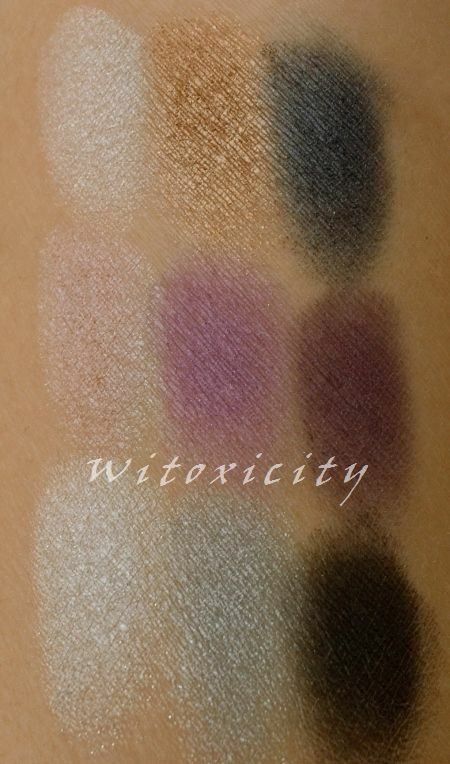 These eyeshadows should be intense and pigmented. What I got instead were half-hearted, sometimes chalky colours - too much talc and not enough colour pigments. 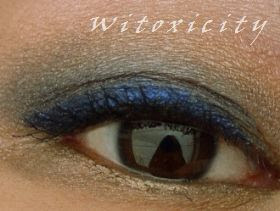 In the eye looks above, it was the eyeliners that made the look. 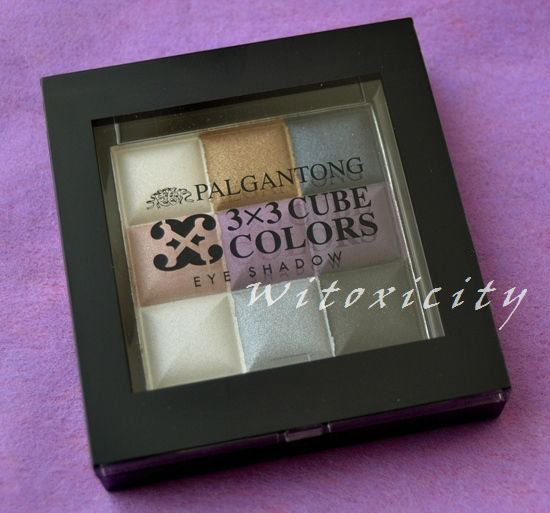 The Palgantong eyeshadows just faded into the background. I should have spotted this little line (but didn't) in the corner of this 3x3 Cube packaging while at Sasa: Made in P.R.O.C.. Seriously? I have nothing against China but when I see a Japanese makeup or skincare brand, I expect its products to be made in Japan. I mean, I can't imagine Shiseido or Kanebo products being made anywhere else! Can you?! I paid the equivalent of about €15 for this palette. It's not worth it. The Palgantong brand falls under a company called Dodo Japan and the brand is especially famous for its Palgantong Theatrical Powder, a loose face powder worshipped by some (no, not me). 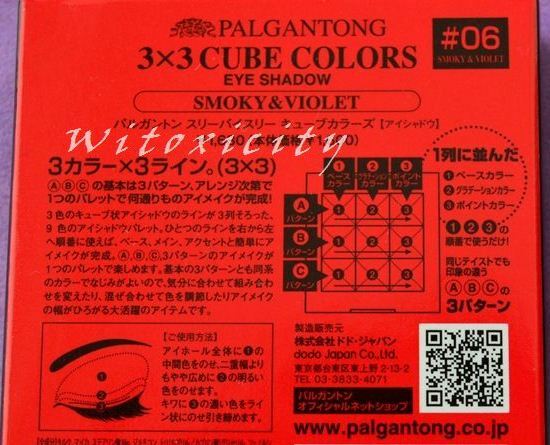 If you're curious about its products and the other variants of the 3x3 Cube Colors, check out the Palgantong website. It's in Japanese but it's fun to just look at the colours and its other offering. 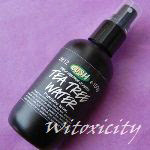 Some of Palgantong's products can be purchased through Sasa.com, Amazon US and Amazon UK.